“Finding Me…Finding You A Pursuit in Happiness” from Christian Faith Publishing author Michelle Marie is a collection of poetry and reflections on the journey to finding happiness. Written during a time in Michelle Marie’s life when she was struggling to find her way, “Finding Me…Finding You A Pursuit in Happiness” was created for those who need guidance and inspiration. “Finding Me…Finding You A Pursuit in Happiness” is the creation of published author, Michelle Marie, an elementary teacher of 22 years and writer by God’s design. Michelle holds a BA in Business Administration, a degree in elementary education, and a MA in Early Childhood Education. Readers can visit Michelle’s blog at https://apursuitinhappiness.com/. Published by Christian Faith Publishing, author Michelle Marie describes the struggle to find happiness as a feeling of being “lost.” People know when they are not happy, but they often do not know how to find happiness. 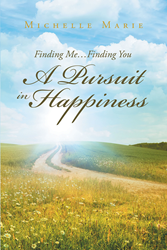 “Finding Me…Finding You A Pursuit in Happiness” was created to help readers look within themselves and to God in order to help them find the answers they need. Michelle began writing the book at a time when she was lost and just starting to stand up for herself. It was a time when she was learning how to remove the dysfunctions in her life. Making major changes in life is very difficult. Focusing on her own problems, instead of others’ was especially challenging. The poems and reflections found within “Finding Me…Finding You A Pursuit in Happiness” are the feelings and thoughts of the author during this time in her life. View a synopsis of “Finding Me…Finding You A Pursuit in Happiness” on YouTube. Consumers can purchase “Finding Me…Finding You A Pursuit in Happiness” at traditional brick & mortar bookstores, or online at Amazon.com, Apple iTunes store, Kobo or Barnes and Noble. For additional information or inquiries about “Finding Me…Finding You A Pursuit in Happiness”, contact the Christian Faith Publishing media department at 866-554-0919.